We have waited long enough with the frigid days of winter now leaving us, for better weather, rising lake levels, new weeds growing and…big bass! If you read my most recent lake report on Alabama’s Lay lake (situated just downstream of Logan Martin Lake on the Coosa River System), you will see the recent rain we needed so bad, is finally doing some good. Lay lake has returned to full pool (after being down almost 3 feet in recent months) and so has lower Coosa River lake’s Mitchell lake and Jordan lake. Even Logan Martin has risen a few feet, traditionally being down from 4-5 feet during low, winter pool. I hope our neighboring state of Georgia (with lakes like Lake Lanier that is very low), are having as good a results from the recent rain. Logan Martin Lake is usually back to full pool by mid-April. I agree. 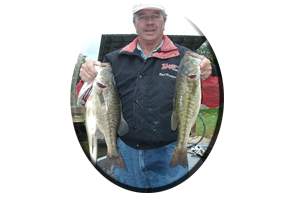 These are big, tackle-testing spotted bass – any angler would be proud to do battle with, especially if he / she was fortunate enough to land such a fish! Hard fighting, hard pulling, hard to land, and hard on equipment and fishing line! 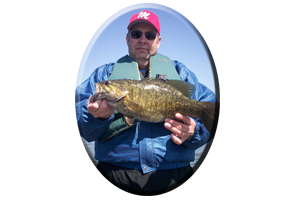 Many huge, spotted bass exist on Logan Martin lake and many have eluded capture, mostly due to angler error. Be prepared when you come to tackle such an adversary! Sharp hooks, quality equipment and strong fishing line, including a good net and net man will be needed! I’ve had the pleasure of living in Birmingham, Al. just 35 miles from Logan Martin lake, all my life. I can remember the days, of not having the pleasure of owning my own boat. I rented an old, leaky wooden boat at the lakes lower launch at Town and Country Boat Launch. Bringing along an old, metal coffee can for bailing water – was standard equipment in those days. I learned a lot since fishing Logan Martin Lake over 30 years ago and about 25 of those past years have been participating (and winning) in major bass tournaments held in the spring on Logan Martin Lake. I can tell you one thing about fishing bass tournaments in March on this lake…They can be won with spotted bass! Oh, of course some fortunate angler may get you on “big bass of the day” with maybe a 6-8 pound largemouth bass. But I’ve seen a few, and I’ve even won a few major bass tournaments on this lake, with a limit of 5 spotted exceeding 20 pounds! One, out of Poorhouse Branch marina in March, we won with 5 spotted bass weighing almost 23 pounds! 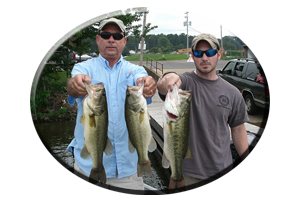 Spotted bass weighing from 4-6 pounds are a possibility at any time on this lake. Your chances are increased during March. This is when they move shallow and spawn. It is also a time when these big, spotted bass visit the shallows in reckless abandon. Meaning they will blast a well placed lure on any outing. Main lake points are one of these spotted bass most popular gather spots. Especially in March. The mouths of creeks, pockets and small cuts, all have points leading into them and secondary points leading further up in these out of the current spawning areas. The better ones have small pebble rocks, or feature a hard, red clay bottom. Other good bedding composition is sand, or a bottom featuring small pebble rocks, with small scattered stumps and boulders, all found on these points as well. Block walls, rip-rap lined banks and small islands are also great places to display all those new lures, you have waited to wet all winter long. In March, for fooling these big, spotted bass. 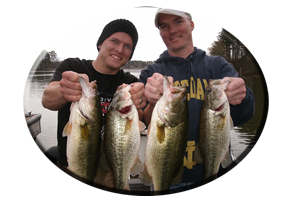 Largemouth bass may be a little slower to hit your lures in March and they may not spawn later until April. But you can discover some big, hungry, prespawn largemouth bass mingling with their cousins the spotted bass, in some of the very same places. Fan casting a variety of lures all along the sides, ends and deep drops around these points, islands and other places like rip-rap rocks, are deadly techniques for covering water fast and often triggering strikes from largemouth bass, in off-colored water – to clear water conditions. Bass, that must track down the lure, rather than be allowed a good chance to see it. There are certain types of lures for these tactics in March. Covering water fast in March, while fishing along these points and drop-offs, always calls for the use of lipless lures. These are those flat sided lures with all the internal rattles, that you control the depth with when retrieved, because they sink. They fool bass of all kinds. Like the name sake lipless lures of all time, “Bill Lewis Rattletrap” or “Cotton Cordell’s Rattling Spot.” If you fish these lures in weights of 1/4 ounce to 1/2 ounce sizes and you want them to sink fast, then using lighter line in the 10-15 pound test category will help the lure sink faster. Adding oversized hooks or wrapping solder on the hooks, help them sink faster to. If you want these lipless lures to run shallow and sink slower, then using line in the 17-25 pound test, allows then to sink slower than with the use of lighter, more thinner diameter line. * Another tip for landing bass hooked on lipless lures! Unfortunately these type of lures are labled as some of the most fish-losing lures around. The bass gets leverage after being hooked and then they jump and usually sling them. Lipless lures are therefore much easier to lose a bass, than when using other lures. * Remedy – To avoid this happening, I have found using long rods (like a 7 foot flipping rod), heavy monofilament line in the 17-20 pound test category and getting a good, hard, rod sweeping hook set is very important. Especially when utilizing long cast’s usually associated with the use of lipless lures. Long casts allow more line stretch, especially in lighter line situations and when using shorter rods. Which allows less of a good hook set – resulting in lost bass. * NOTE – After hooking a bass, while fishing lipless lures on a long rod, sticking about 1-2 feet of the rod under the water, while quickly reeling in the bass, will help you land and lose less bass! The bass cannot jump and clear the surface of the water when you do this! Also, never allow any slack in your line, or hold your rod high up over your head. This is when most bass get loose! Of course, always replace all hooks with good, sharp hooks like Gamakatsu’s # 4 size EWG treble hooks. Shallow to deep diving crankbaits and both suspending and floating jerkbaits are good in March for big, prespawn bass. Also try soft plastic jerkbaits and even topwaters in March. Fish shallow along both sides on these prespawn points, especially in stained water. 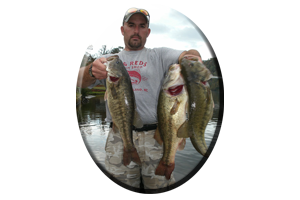 Always try a variety of spinnerbaits in all sizes, colors and with various types of trailers. * Jig combos, small finesse lures and tube baits, even Texas rigged worms and lizards, are always deadly lures in spring on Logan Martin lake! Although there is much more to be said about prespawn bass, conditions change for the better when it comes to most bass bedding in April on Logan Martin Lake. For one thing lake levels slowly return to full pool. By the end of April the bass have spread out in their newly flooded homes in the shallows. New growing, oxygen-rich green aquatic weeds begin to emerge again in April, as their evident, rich green growth becomes more visible with each passing week of life giving sunshine. Within these new growing weeds lay the bedding bass and soon…their newborn offspring fry. Most bass will begin their bedding rituals around the first week of April when the shallows warm into the upper 60′s and low 70′s and stabilize close to a full moon. Cold fronts can stall the bedding season as much as 30 days, until the next full moon in late April or on into May. When most of these male and female bass court and prepare their beds they do one thing first. They eat. So prior to bedding, these bass are feeding every day and fattening up, to put on the needed weight and fat reserves to fast and go from 2-4 weeks without eating. Male bass have been observed protecting the bed and newborn fry and not resting or eating for 30 days! Most female bass lay their eggs, stick around the immediate bedding area a few days and then mosey off. Not to far away from the bed, letting the male bass do the rest of the work. But many big, female bass, again feed after bedding, showing lots of big bass still in the shallows – feeding, while other late spawning bass are just beginning to bed! Although April can be fun and show a good chance at a big bass or two, May can be more promising and with several good reasons. First of all, most big, female bass have ceased the rituals of the spring spawn by the first week of May. Sure, there are still some nice bass lingering around the shallows, some even displaying a bulging belly full of eggs, or a very evident bloody tail from fanning the bed. Such as those late spawning bass found in the lower lake region, where the lake’s deeper water is the last to warm. But for the most part if you observe every bass you catch, especially the ones that look to weigh 3 pounds or more and displaying an empty, skinny belly. You will discover there are very few bass still waiting to lay their eggs in May. Most look skinny and in need of eating. The second thing in an anglers favor when targeting big bass on Logan Martin Lake is their hunger after the spring spawn. These bass must eat soon. To survive, they must replenish fat reserves that have been lost in the last few weeks…or they will die from starvation. This is why catch and release is so important during the spring season of the year. Being a very hungry bass is like being a starving human. You will eat almost anything that comes your way. Especially a bigger than normal portion that fills an empty belly fast. Big, slow moving meals are also much easier to track down and capture – than much harder to catch smaller meals. So in May, bigger is often better, when it comes to lure choice for big largemouth bass. Big, oversized topwaters like walking-type topwater lures; Zara Spooks and Sammie’s. Or loud, poppers, chuggers or other concave mouth topwaters, jerked when retrieved to get loud, splashing results. Buzzbaits (often the louder the better), are excellent lure choices for numbers of big bass in stained water conditions. These lures cover water fast and can be “big bass” lures in Spring. Trailer hooks are always suggested for short striking bass. Frogs, rats, soft jerkbaits, floating worms and techniques such as swimming a lizard / fished weightless, are also deadly in and around weeds and wood cover on Logan Martin Lake. As waters warm in May – so do more prey emerge. This is the month when bass get back to what they are best at. Eating.